Our newest project is working to donate 20 Solar Cookers to the participants of 2014's The Great March for Climate action. The march will start on the 1st of March 2014 and end on November 1st 2014 and will cover a path all across our nation starting in California and ending in Washington, DC. Help us to help cook the food for all of the march participants by using a safe and environmentally friendly method of cooking...Solar is our most unlimited resource and it should be a part of everyone's lives. Not only is solar cooking environmentally friendly, but it is economical and sustainable. Why not use a solar cooker to be prepared for a disaster or emergency need as well? Help us to donate more solar cookers by clicking on the link Donate for Solar Cookers. There are many people throughout the world that have severe challenges each and every day when it comes to obtaining a nutritious meal even once during a day. In many countries children and adults go to bed with empty stomachs due to a lack of basic food staples brought about by severe economic and political strife coupled with natural and man made catastrophes. Often, through no fault of their own, these people suffer the effects of near starvation and severe malnutrition. Much is being done around the world by humanitarian aid organizations to help alleviate the suffering that comes with this acute lack of basic nutritional needs among the worlds poor and destitute. Studies have found that a key factor in obtaining basic, daily food needs by a large majority of people in many third world countries is the ability to buy or barter for them, using the scant incomes or earnings (if any at all) that they might be lucky to attain through thrift or industry. But then, many often encounter a conflict of need by having to use a substantial portion of their funds and resources to purchase cooking fuel such as wood, kerosene, charcoal etc. in order to cook the meager provisions they have acquired. Moreover many women and children waste valuable hours each day and confront numerous dangers scavenging for scarce and over utilized fuel sources such as firewood, animal dung and petroleum based cooking fuels just to be able to cook their meager meal supply. Several Organizations have sprung up around the idea of utilizing the power of the sun, in the form of solar cooking, in order to help the worlds most destitute have the means to retain more of their funds for food and also to be able to cook it without further expense in the process. You can go to our site page Solar Cooking Initiatives for more in depth information. We here at solar cooker-at-cantinawest are pleased to be involved in our own small way in the initiative to spread solar cooking around the world. We take a portion of the proceeds from all of our solar oven sales and contributing to the major organizations heading up the solar cooking initiatives across the world. These contributions make it possible to provide these much needed cookers to people who would otherwise not be able to afford the cost of buying or making their own solar cooker. Along with our use of a portion of the proceeds of these sales, you can also make a direct donation to help supply the needs of the suffering by donating the cost of one solar panel or box cooker for the small amount of only $25.00, which in turn will give a family the gift of safe and affordable nutrition. But regardless of your financial ability to help we will gratefully accept donations of any amount. * If you would like to donate a dollar amount towards a solar cooker for someone in need please do so here. Greetings, My name is Nathan Parry, I am the owner of the website; Solar Cooker at Cantinawest. My son, Joshua Parry, has chosen for his Eagle Scout Service Project to raise funds and buy solar cookers and food to take to the Navajo Reservation in Arizona (in the Four Corners Area) and to teach three different families for a whole week how to effectively use these solar cookers for cooking all of their meals. We are working in conjunction with the Park City, Utah Based Non Profit Organization, Adopt-a-Native Elder, to bring about this service project. The Solar Cooking Service Project will take place over a weeks period of time, from June 25th to June 30th 2012, with hands on teaching and application everyday for each of the families and their members. There is a great need for alternative methods of cooking among the poorer families on the reservation because most of their cooking, boiling, heating and such are accomplished mainly through the use of wood or gas, which is a limited resource as well as being a costly form of fuel that requires continual replenishing. In order to raise the funds for this Eagle Scout Solar Cooker Project we are going to be holding a solar cooking demo on the 16th of June 2012 in the St. George/Washington, Utah Walmart Parking Lot from 10:00 AM to 3:00 PM. Solar Cooked samples will be given out and an opportunity to see and learn about solar cooking and the Navajo Reservation Eagle Scout Solar Cooker Project. * * We would also like to take this opportunity to ask for small donations through our website as well; from our fellow solar cooks from around the USA and around the world. For those who find it in themselves to help us help these Navajo Families who will be the beneficiaries of this solar cooker project, we would be very grateful to you. We are asking small donations of anything from $5.00, $10.00, $15.00 or $25.00 all amounts are helpful. We thank you for your time and your generosity. We would like to invite you to help through other organizations also! 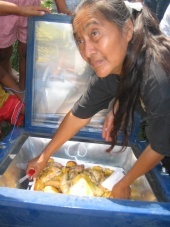 Find out more about other organizations who are heavily involved with solar cooking programs through out the world and who could also use your help and support to further the excellent work they are currently undertaking. Below are some links to the organizations' information and contact pages so that you might find out how to best help by whatever means available to you. Help someone to be able to help themselves.